Bushfires are causing Australia unsustainable losses in lives and assets, much of it preventable if our fire brigades had the best equipment. Captain Graham Bates has a plan. This article first appeared on the Independent Australian website. In the long shadow of these upheavals, we gather to ponder their meaning, and to commemorate the values that shone in their wake. Courage under pressure, ingenuity in adversity, bonds of mateship and, above all, loyalty to Australia. It was these acts of ‘ingenuity in adversity’ by General Sir John Monash and the Australian Corps that helped secure victory. Monash honed a new strategy of combined arms, where aircraft, artillery, tanks and infantry broke four years of stalemate, bloodshed and sacrifice. Today, we are not mired in trench war-fighting overseas, we are facing a dire ‘combat’ situation upon our own soil — bushfire. A Victorian CFA fire-crew in action during the Black Saturday Bushfire catastrophe of 2009. According to the Australian Institute of Criminology, bushfires have claimed over 550 lives over the past 100 years, injured more people than any other natural disaster and have caused massive economic and environmental damage. It has been estimated that between 1967 and 1999, major Australian bushfires have cost A$2.5 billion. The Royal Commission into the Victorian Black Saturday Bushfires has reported that this single event cost 173 lives, over 500 severe injuries and A$4.4 billion in damages. This only relates to immediate costs. Long-term costs include ongoing physical, psychological or emotional trauma and the costs of counselling and assistance to families, victims and survivors. Loss of livelihoods, jobs, tourism, flora and fauna, environmental costs to water catchments and greenhouse emissions are unquantified. Let us apply the wisdom developed through sacrifice during combat in World War I. To reduce destruction from bushfires, we need fire-fighting equipment like these specially developed armoured vehicles pictured here, part of the Armoured Strike Team. 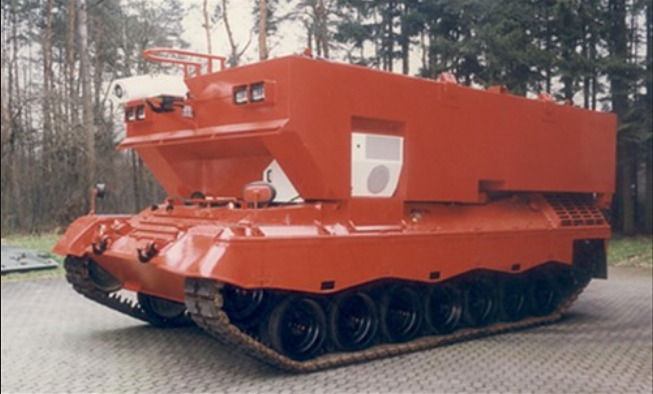 The Leopard 1 Jumbo PHF 20 T is another valuable tool in combating bushfires. It contains 20,000 litres of water with the crew having nuclear, biological and chemical protection. The Fireking is the fire-fighting version of the successful Bushmaster. The ‘Burnover Standard’ requires the vehicle to survive 20 minutes of intense fire, replicating typical bushfire radiant heat levels. In 2007, it was, perhaps, the only fire-fighting vehicle to achieve this standard. The Fireking is built by Thales in Bendigo, Victoria, but they are only in service with the Forestry Commission in Mount Gambier, South Australia. Why are no other fire-fighting agencies using these vehicles? A short photo presentation of Forestry South Australia's Fireking Forest Fire fighting vehicle. These the new vehicles form the proposed Armoured Strike Teams (AST). They do not replace the existing fire-fighting vehicles, but augment & enhance the bushfire combat capabilities of the current fire-fighting vehicle fleet. The aim of these small ASTs is to provide a heavy knockdown element to all Australian bushfire brigades. Current vehicles used by our Australian fire-fighters do not have anywhere near the protective and fire knockdown capacity of the proposed AST vehicles. It holds 3,500 litres of water, plus a 40 litre foam concentrator storage unit. There are several problems in using standardized, commercial, truck cabs and chassis units as a basis for front line bushfire vehicles. These shortcomings have been detailed in a 1999 paper by Bruce Paix, entitled Improving Burnover Protection for Australian Bushfire Appliances. Commercial truck cabs have flammable vinyl/synthetic interiors. These can ignite and/or smoulder, giving off toxic vapours and smoke, forcing the fire-fighters to abandon their vehicle, which may well be their only refuge. Vehicles such as the Leopard, Fireking and the Marder variants do not have “door trim” or “synthetic interiors” as they are designed to operate in dangerous fireground environments. The Fireking has a specially designed interior that does not flame or produce toxic vapours. It also has no side doors, so there is no risk of door seals catching on fire and penetrating the cab. A 'scorched' prototype Fire King after successfully withstandingthe CSIROs 'Burnover Standard'. Despite the scorch damage, this vehicle was driven off the test-bed after the test. Commercial trucks often have unprotected fuel tanks, which may increase vulnerability. One notable feature of truck braking systems is that any drop in air pressure in the lines due to damage will cause the brakes to “lock-up”. Should this happen on the fireground, or during a burnover, the truck is effectively immobilized, leaving the crew in dire peril. This includes tyres, fuel lines and hoses. In some cases, these have caught fire and led to the complete destruction of the truck. Engines have failed to start or run when they are subjected to intense heat and smoky conditions. There have also been instances where burning embers have got into the engine and burned out the turbocharger, again immobilizing the vehicle. Fire intensity, direction, or sudden wind gusts can entrap fire-fighters and their vehicles. Potential equipment failures such as these leave everyone vulnerable, including firefighter crews, residents the fire-fighters were tasked to help and other fire-fighters trying to rescue the immobilised crew. Of course, it there are also the effects on morale effects when fire-fighting authorities cannot protect their personnel and the public. The Fire King in self protection mode at Mount Gambier, SA. Crew access is via a central door at the rear of the cabin, eliminating the risk of fire penetrating the crew cabin fire door seals as can happen with traditional vehicle configurations. Emergency exits are through side cab windows as shown in this image. Are the lives of Australians worth saving? Our fluctuating weather cycles between floods and drought are becoming more severe. The cost in terms of lives lost, livelihoods, homes, properties and infrastructure destruction has reached unprecedented levels in Australia. The 1983 Ash Wednesday bush fires took the lives of 75 people whilst Black Saturday in 2009 claimed 173 lives and severely injured over 500 people. Entire communities were obliterated and the financial cost was put at $4,400 million. For a small population it is unsustainable for us to lose our people and assets at these levels. In Part 2, we explore more strategies to combat drought and bush fire.